Glassblowing is awesome as it is, but making a chandelier… that’s definitely something else. The Science Channel went behind the scenes to film the elaborate glass-working process of building a very fancy 150-pound lighting mechanism. Unfortunately, they didn’t show the creators of the chandelier – that’s Baccarat crystal studio (it’s written on their shirts). This chandelier stretches for three feet in both directions (about 1 meter) and has 24 elegant arms, each ornate with intricate designs. To make the crystals, they melt silica sand in a furnace, along with lead, ash and other materials (for the darker crystals). The crystal blower gathers some molten crystal at the end of his blowpipe, and then shapes the arm as he wants, using specific molds. A channel is made down the middle for the electrical wire. Next, two glass workers work together to shape and twist the molten glass into its rope-like aspect. This is an extremely delicate and difficult process, and they must stretch the crystal exactly right. After it’s done, they snip the excess on both ends, blowing cold air to speed up the solidification of the crystals. Then, two other craftsmen work on the bottom part, using traditional techniques to place molten crystal into a mold, which is then placed in a press. 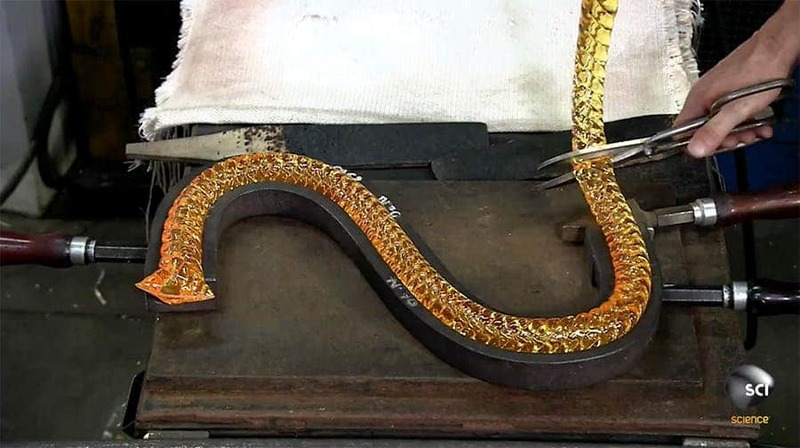 Someone else works on the end design elements, using pliers to lengthen one end into the desired shape – another laborious and delicate process. A mass of glass is placed in a mold and blown to pump up to the desired shape. Every single part of the chandelier is hand-made and manually assembled. All the 24 arms are placed into a tray, with each individual connector leading down to the main wiring. The ruby-red ornaments bring it all together, casting sparkling light. It’s a magnificent chandelier, worthy of being every room’s centerpiece – all created in a dazzling mix of science and art.